The following document explains how to invite a non-Office 365 attendee to an event using the iOS Calendar app (iPhone, iPad, or iPod Touch). iPhone Calendar allows you to invite to meetings anyone listed in one of your Contacts Address List. If the calendar you have set as the default calendar does not allow meeting invitations the Invitees section will not display. Change the Calendar to one that will allow Invitees (e.g., the account for Office 365). To invite someone to a meeting create a new event or edit an existing event. In the Edit display scroll if necessary to show the Invitees section and tap on it. In the Add Invitees display you can type an email address directly into a field and press return. iPhone Calendar will add them to the attendee list and send an email to them. Alternatively, type part of a name and iPhone Calendar will begin searching your Contacts. Matches will be displayed if they have an email address in your Contacts. 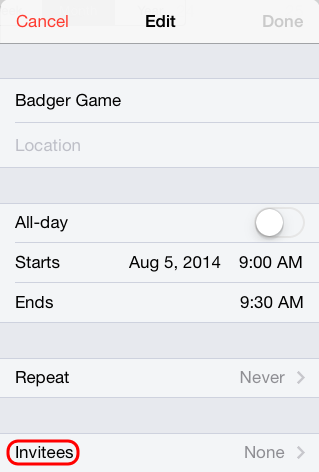 Tap on a match and iPhone Calendar will add it to the Invitees list. To delete an attendee, backspace over the entry. Tap the red Edit button in the top left corner when done. The Invitees section will show the number of invitees to the meeting. Tap the red Done button to continue and return to the main display. NOTE: You should not use these steps to invite someone with an Office 365 account. See this KnowledgeBase Document 35507 for how to do that.